A plain, white golf ball can be difficult to distinguish from similar balls. Personalized golf balls range from simple customizations using a permanent marker to complex designs that are printed directly onto the ball, and can feature multiple colors with precise detail. A personalized ball ensures that your balls will not be confused with balls of the same brand and make if you lose sight of your ball on the course. The most intricate designs available for a personalized set of golf balls are printed directly onto the golf ball. Digital images are created and loaded into a program, and the balls are then loaded into a special printer where the images can be applied to the surface of the ball. Custom printed balls are popular as souvenir items, such as balls marked with logos of famous courses or marked with logos of professional sports teams. 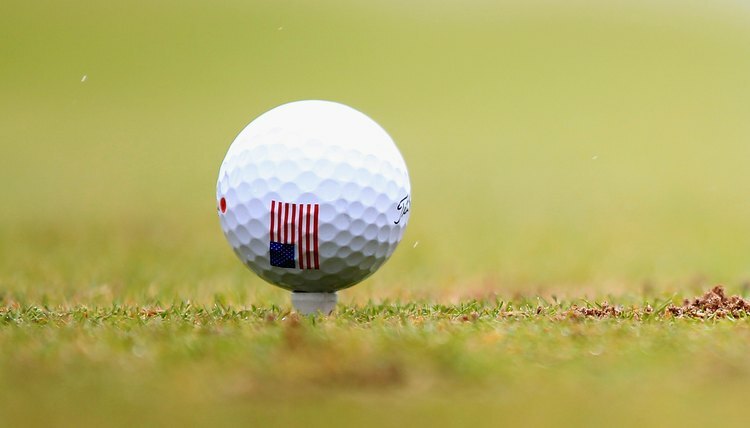 Many golf outings also order personalized balls that feature a logo representing the outing, which are then given out to the participants as something with which a player can remember the tournament. Using a golf ball stamp is a method of creating multiple identical marks on a group of balls without having to utilize a special printer. A stamp can be created for a single color logo in the desired shape of the personalized image. Golf balls then are simply pressed into the stamp when it has been loaded with ink, rolled slightly to ensure a full transfer and removed to dry. While the process is slower and less detailed than the printing method, it can also be performed cheaper. It is a great way for a golfer to create a personalized image to place on all her balls with only the single upfront payment to purchase the stamp. Using markers to personalize a golf ball is the most common method of marking a golf ball for weekend golfers, as no special tools must be used or purchased. Simply taking a permanent marker and writing on the surface of all the balls a player will use allows him to create a personalized look for easy identification of their balls. Filling in dimples on the surface of the ball in a specific pattern, such as three green dots in a triangle around the ball's number, is a common method; however, some golfers also will draw simple images, like a smiley face or star, or mark the ball with their initials. What Is Used to Clean Golf Balls?